Here's another example of a book that I catalogued for the books-for-sale section of this blog that may be of some interest to general readers: the first weather map printed in the U.S. (1838). I'm returning to this post (from ten years and 4300 posts ago) on the question of "where is the West?" because I thought I had stumbled upon a very early mention of the related idea of "the western frontier". The phrase popped up in an article on the telegraph systems of the world (in the Journal of the Franklin Institute for 1852) and in the section on the U.S. there is a mention of telegraphs "now extending from the verge of civilization on the western frontier (east of the Rocky Mountains) to the northeast extremity of the United States". It struck me that--I thought--I really didn't recall seeing "western frontier" (without a capitalized "W") all that much in the mid-19th century, let alone discussing it in terms of Colorado. To check out the scarcity of this phrase I checked out the Frederick Jackson Turner piece that started this whole idea of the study of the U.S. frontiers and scanned for the elements, finding "frontier" mentioned 168 times, "west" 107 times, "western" 42 times, but with only four appearances of "western frontier", and that usually in reference to the slavery issue. The OED was no help on this, unfortunately, and could not establish "western frontier" in the long entry on "frontier", which has a very old and long usage in English. From there I went over to WorldCat, and checked out the appearance of "western frontier" in the titles of books printed 1800-1860, and found in the dozens of millions of book records that it seemed to occur hundreds of times. However, once getting rid of duplication, and works that had "western" and "frontier" in the title but not together, it looked as though there might only be 10 or 20, but a short look at that set showed the usage in the form I was looking for reaching back into at least the 1820's. So, my 1852 reference was way late, but I think I might be able to say that "western frontier" really doesn't pick up in usage until after Turner's 1893 piece. This wonderful map is from Charles Paullin and John K. Wright Atlas of the Historical Geography of the United States, Washington, Carnegie Institution, and New York, American Geographical Society, 1932. It is just so very interesting and unusual--I'm not so sure that I've seen another map quite like this, illustrating travel time and difficulty.. One major stand-alone feature here for me is the distance from New York City to my own area of the U.S., the southern Appalachian region of western North Carolina: it took six days to get to Savannah from NYC and two weeks (!) to get up here in the mountains, which looks to be about the same amount of time it took to get to the Chicago area. Of course once you got to Asheville in 1830 you were, well, probably looking to get somewhere else. I'd take it that the turkey population vastly outnumbered the people. Maybe the horses did, too. Getting back on track here though the West in the U.S. at the time began just on the other side of the state of Tennessee, and it wasn't but a couple (?) of censuses before this that the West was right about at the Cumberland Gap/Ohio River basin region. Perhaps this leads us to a more interesting if badly-asked question: where does the American West begin? This is an awfully tricky question, best left to the answer that pops into your mind the instant you hear the question, before the problems of what the sentence entails creep in. Locating where the West begins is a curious, personal adventure--is it on the other side of the Mississippi, or does it really start in Texas, and once in Texas does it start in Austin or the sleepy Brazos? Does it really begin where the sign says it did, at Meacham Field in Fort Worth? It depends on the era, too, as we just said above; in the 18th century the American West was really out there with the makers of the martyr Bibles in Ephrata, which means that the rest of the place was really very big. And of course you can go all the way back to the beginning of European colonization here, all of North America was the West, at least to the people who were boarding the ships thousands of miles away across the Atlantic. And even once they got here the West was problematic--for the Spanish in the southlands there doesn't really seem to be a "west", only the northlands. In the 16th century the West was just creeping into Pennsylvania (Penn's Forests), and the French and Indian War in the mid 18th century was fought over the control of "the West", the crux of it all heading down to the forks of the Ohio at Pittsburgh. Even in the late 18th century, the West was still not all that far away, relative to what we think of today, what with Kentucky being the first "Western" state admitted to the Union (in 1792). It would probably be easiest just to say that the Mississippi River is the dividing line; after all, Lewis and Clark departed (in 1803) on their expedition from St. Louis (as did hundreds of thousands of other people later in the century who were seeking their new life in the West). Then there's the West of Saul Steinberg. who puts the whole thing on the other side of the Hudson...I'm not so sure if the West didn't start for some people somewhere along 11th Ave.
And where does the West "end"? Does the West make it all the way to California coast, or does it stop in the desert, east of Sacramento? Do people think of Oregon and Washington as the West; certainly they're western, but are they The West? To really complicate things, I guess you could define the middle of the West and look for the boundaries. But the middle of the West usually seems to me to be flat and red and not terribly high; who's to say that a nice town in Colorado (Salida?) might not be the middle of the West, even if it is 7,000 feet high? Its a tricky question and probably most people have a different answer for it. For that matter, what about the South? Where does that begin? I'm in a southernish state, but I hardly think of Asheville as being in The South per se. Maybe we're too high; maybe the place over 2000' in elevation that are south of Pennsylvania are just Appalachia, and actually not part of the South. Scotland Neck over on the other part of my state is definitely the South to me, but perhaps it isn't too much very Southern for someone in the high delta, or taking an easy afternoon in Oxford, Mississippi, or anywhere else in the Louisiana-Mississippi-Alabama-Georgia block. I know that to Robert Johnson and Honeyboy Edwards and Son House and Muddy Waters and anyone else in Coahoma county that the South didn't go all that far north from where they were sitting. .In maps from sat 1850-1890 that area is called "the deep south"; seems to me that anytime you have a geographical location with a qualifying prefix, you're actually dealing with the real thing, everyone else without the prefix being pretenders, or just something else. Same too for the North--is everything above Washington D.C. northern? I wouldn't tell my father that, being a Berkshire Hills (MA) boy; but that's another problem, especially to someone in Bangor. So somewhere in all of this, after figuring out where all of these places start, somewhere in there is a place in this country that rejects these geographical delineations--that's the place I'd like to find. (When I was describing this idea yesterday to a friend, Renee, a Texan via way of Alabama--like many of the defenders of the Alamo--the answer came immediately: "Kansas" she said. I'm not sure I agree. But then once I get past my immediate response (Texas without Trees), I start to think of a 3-D representation, trying to accommodate time. I don't have answer for the place that isn't anywhere, but once you start drawing enough circles to signify where The North South East West is/are, there is sure to be a little spot that gets overlapped by all of the circles more often than any other place--and that is where I think you'll find Nowhere. I've just found an interesting example of a photo reconnaissance display of trenches with an interpretation of installations and trench names. It is interesting in and of itself, of course, but I was drawn to it because of the zig-zagged lines of the trenches explained with criss-crossed straight lines. The trenches went off at hard angles rather than long straight lines for several reasons, all for defensive purposes: first, they could offer places to use for fire cover if the trench was overrun by enemy forces, and secondly as a dispersal agent for the effects of bomb blasts within a trench. The photo "An Example of an Annotated Photograph with Local Names of Trenches Inserted. An example of an annotated photograph with local names of trenches inserted also information collected from all sources" is a silver gelatin print from the George Eastman Museum. The first image below is a detail from the overall image, used here just to show the accumulation of lines. The full image follows, showing dugouts, latrines, cables, ammo dumps, linked bomb craters, and gaps in the barbed wire enabling patrols to come and go without becoming hopelessly tangled in the sharp steel. _____. Rats Alley: Trench Names of the Western Front, 1914-1918. Gazetteer of British trench names, as well as an appreciation of the naming practices and names of German and French trenches. I found this fine bird's-eye view in the 8 August 1901 issue of Scientific American (the lower image is what I'm referring to). It is a low-level oblique that shows about the entirety of Manhattan, from South Ferry to what is probably Harlem, and it seems to be an image that is not often reproduced. While looking around online for something similar I found a great selection (19 maps, documented and linked) at the terrific (and now on hiatus) Bibliodyssey website. There's no sense to reproducing all of the hard work that PK (Mr. Bibliodyssey) did in assembling his view selection, so just follow the link to his site and enjoy. This view reaches from Grand Army Plaza all the way to Yonkers, and it shows that even in 1909 there were some green areas left in Brooklyn in the south towards Jamaica Bay and out east (my mother's mother was from Brooklyn who as a girl didn't have to go far from Boro Park to go sledding on an open hill). Also it looks as though the Sci Am image also reaches almost to the Grand Army Plaza, but not much else in Brooklyn. Anyway, its a beauty. This is a "Bird's-eye view of New York with Central Park in the foreground", by George Schegel, published by George Degen in 1873. This is sort of the opposite of the Sci Am image, though the perspective is not quite right and the point of view is much closer to the ground--still, we see all of Manhattan from Central Park south to the Battery and beyond. This view has an odd feel to it, as though you're looking through the wrong end of a binoculars--still a fantastic piece of work. In the long history of finding the Center of Things is the subset (or overset) of finding the center of the galaxy (which until the 1920's was the universe) or of creation. The center changes over the dozens of centuries, not the least of which was the flower of creation blossoming outward from Jerusalem. Image source: Greenwich Observatory29x23cm http://collections.rmg.co.uk/collections/objects/263846.html (This is a depiction of the center of the universe, the Central Sun, as hypothesized by William Herschel and later by Johann Henirich von Maedler (1794-1874), who published his observational results in Die Central Sonne, Doprat, 1846.) This legend to this image is very legible once expanded. Where is the center of the Earth, of religion, of the United States, of the universe, of art, of consciousness, of seriousness, of complexity? The center of stuff throughout history has been an almost entirely shifting matrix, a collection of vortices coming from Jupiter’s strongbox–a three dimensional representation of the location of their shifting centers over time would make an interesting Fibonacci-like display, I think.\The question may seem meaningless at first, but people have long asked it of nearly everything within their experience, trying to find the center of their world and universe, of their selves, of their religion, of their country, of politics, of art and music, and on through the Encyclopedia of Things that Could Have a Center. Take for example the questions of where the center of the Earth, or solar system, or galaxy, or universe might be? There have been answers to these question more often than not over time, though the answers have been shifting. The center of the Earth has certainly stayed more-or-less constant over thousands of years, though the stuff in the center has been swarming with change, from being hollow, to being filled with magma, to being a solid magnetic core, to being occupied by Mole Men, to housing the seat of the Inferno, or to be simply located on the surface of the sphere at Jerusalem (as the old T-maps have shown for hundreds of years), and on and on. Working backwards, the center of the universe has drastically changed over time–for thousands of years, it was assumed that the Earth was the center of all things, until it wasn’t (that beginning mostly with Copernicus, and then challenged with Galileo’s use of the telescope and his discovery of an order of magnitude more stars, etc.). And then William Herschel beautifully represented the shape of the galaxy in 1782, placing our solar system in a far from central location. The center of the universe’s fate changed along with that of the Earth, incredibly so beginning with the Big Bang and then with the possibilities of their being a universe without boundaries. And then of course there’s multiple universe theories, and worm holes, and the space time continuum, which complicates things even further, making the discussion of a “center” pretty much nonsensical. Simpler things can be as complicated–where is the center of the United States? If we measure the center for the lower 48 states, it will be different than if we included the two far-flung states, or protectorates like Puerto Rico. The geographical center is one thing; another might be where the population center might be–that has made a beautiful map published over time by the U.S. Census Bureau (Department of Commerce), showing the star of the center moving not-so-slowly westward into Ohio over the last 20 censuses or so. And where is the heart of the country? Where is the heart of the West? Better yet, where is the center of the West (or North, or South, or Mid-West)? To answer where the center of these places might be you’ve got to first locate where those geographical ideas begin and end, which for many is a tricky subject, making it a matter of opinion as to where the center of these places might be. The center in art had been a findable thing for some time, though more recently people like the Impressionists and Kandinsky have shown that the center might not exist, and it might not exist along with anything that is recognizable as a form of nature, representation and the center falling away completely. Perhaps this is like finding the center of a decade or year or month, or week or day or second. The parameters keep getting both smaller and larger, the ability to measure halves of things or the center of a second growing almost incalculably small, small enough to reveal that in this Zeno-paradoxical way, that there is no center because there are no boundaries; getting half-way to something into infinity doesn’t actually get you there. Now, getting back to today's image: this lovely illustration shows what is supposed to be the center of the galaxy, which at the time also meant the center of the universe. The model was based on the observations and hypothesis of William Herschel, and then later more firmly put forward by Johann Henirich von Maedler (1794-1874), who published his results in Die Central Sonne, Doprat, 1846. The Central Sun was supposed to be the star Alcyone in the constellation of the Pleiades. Alcyone (or Eta Tauri, "the Central One"), who in legend threw herself into the sea in deep grief after an encounter with the disguised Morpheus; the gods though took pity or exhibited compassion and changed her into a bird, the Kingfisher. The Kingfisher is a bird which lays its eggs around the time of the equinox in December, the gods showing more mercy by introducing a period of non-stormy weather for seven days, and so introducing the (H)alcyone Days of winter. (I just missed being able to post this during that period by about a week.) The Pleiades, (“the Seven Sisters”), were the seven daughters of Atlas, who (long story fractured) were turned into stars to ease the worry of the father who was busy doing others things, saving them from their instant pursuers once their protector was otherwise engaged. Orion, however, still pursues them across the sky. 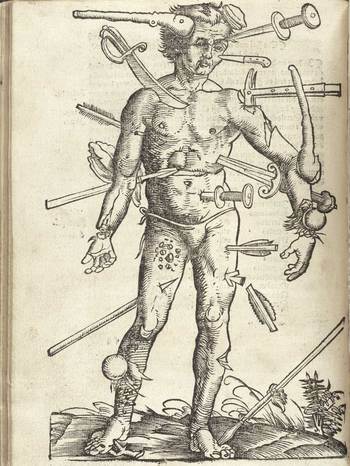 This woodcut of applications and applicators to injured humans, lacking the human, waiting for the human, the missing human, was made by Hieronymous Fabrizzi (or Jerome Fabricius, 1537-1619), and found in his Opera Chirurgica... printed in 1723. Even though this is a pretty straight-forward image, it strikes me as a little odd, a little off, looking a bit like inhuman trappings, the entrapments of a human waiting to be built, an artificial skin with artificial bones. 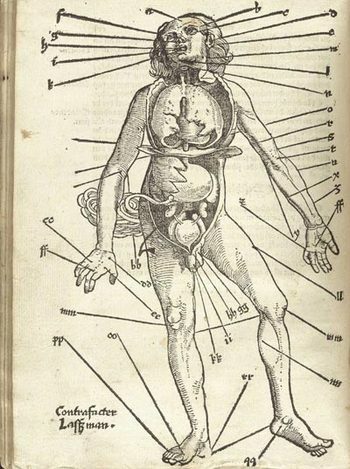 It was much less than that, and in its way, much more—it was a statement of the advances of medicine in the 16th century, a map of the ability of man to replace himself; a map of the artificial man. Perhaps the image of our own artificial man, showing our ability to replace organs, bone, skin, limbs, etc.may come to look to the people of the near future the same way that we here in the present look back on Fabricius’ image. Johannes de Ketham's Fasciculus Medicinae, printed in the year Columbus set sail for India. It was a battle map, really—a battle for the human body, showing the effects of what happened to that body when someone tried to erase its existence. The image is graphic, realistic and fairly gruesome, and highly useful. It was accompanied by instructions on how to deal with all of the trauma, and to save the man thus that he could fight again. This woodcut, as the next, appeared in Hans von Gersdorff. Feldtbüch der Wundartzney (printed in Strassburg, by H. Schotten, in 1528). Well, it really wasn’t like that, not how I mean by a snippy modernist viewpoint looking back on medical history with no contextual appreciation. Bloodletting was an approach to healthfulness, as blood was seen as one of the four major elements (or “humours”) of the human body that needed to be kept in balance. This was accomplished via the application of leeches or by the more common (and quicker) practice of venesection, or opening a vein to allow the blood to come out. (Let’s reference Steve Reich’s magnificent “Bruise Blood” creation of 1966 at this point—I don’t think that I’ll ever have a better chance to drop a reference to this piece of revolutionary music in regards to venesection again.) Thus this map was map for the practitioner of bloodletting—the physicians, and more probably the barbers and other assistants who would inherit this lesser procedure from the more-busy doctors. In the history of maps of anatomy and the general practice of mapping the human condition, this woodcut x-ray of the best places to drain human blood would not survive close to the age of modernity, disappearing almost entirely by the 18th century, and becoming much more scarce well before that. I don't have that much to say about the series of images that I found in the 5 December 1908 issue of Scientific American--except for "Wow!" Sometimes that is about all I can manage, and that's fine. (Richard Feynman, on witnessing the Alamogordo test shot in the desert in 1945, simply said "hot dog! ", which was quite a distance away from Oppenheimer's reaction, and one which I like more.) Anyway, opening up the volume and by chance opening to this full-pager was very pleasantly surprising, and this from a journal which was very successful in achieving their constant goal of being "surprising".